Let ScottCare simplify your cardiac device monitoring for more effective patient care. Improved Clinical Outcomes. Impressive Economics. 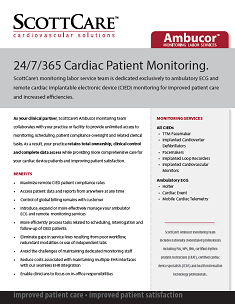 ScottCare's unique monitoring labor service team—"Ambucor"—provides insourced clinical labor services dedicated exclusively to the full range of ambulatory ECG and remote cardiac implantable electronic device (CIED) monitoring. Ambucor supports your staff 24/7/365—ours is the only remote labor force that operates as employees directly under the general supervision of your physicians or hospital staff within the protocols and policies you establish. We're nationally accredited healthcare professionals, including PAs, RNs, NPs, CCDS and CRATs, based in Wilmington, Delaware. Quite simply, we're providers serving other providers. As your clinical partner, the Ambucor team will help you provide more comprehensive patient care with improved outcomes and increased efficiencies, all as you regain control over the patient experience. 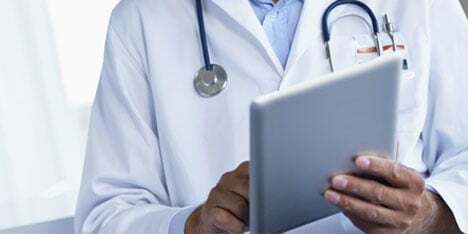 Partnering with ScottCare enables your physicians to retain total ownership, clinical control, and complete and unfettered data access while improving quality of care and patient satisfaction, reducing costs and streamlining workflow. You have access to patient reports and data from anywhere at any time, stored in a secure data center. Multiple clinial trials and studies have revealed the overwhelming care and cost benefits of remote monitoring for cardiac implantable device patients. In 2014, ScottCare's Ambucor team achieved an average interrogation compliance rate of 85% for actively monitored pacemaker and implantable cardioverter defibrillator (ICD) patients. Actively monitored patients—those who were interrogated at least once during the year—accounted for nearly 80% of all patients. In comparison, one recent independent study indicated the industry's average interrogation compliance rate is just 65% for actively monitored patients, with less than half of all patients being actively monitored. "Knowing that the patients are going to come back in 7 to 10 days for a wound check, having Ambucor there to ensure the patients have the handshake transmission, has been a real value because it takes that responsibility away from the nurse practitioner." "ScottCare's OneView CRM software is extremely user friendly. It offers exportable spreadsheets of device and testing history, as well as the ability to arrange and save custom reports." "Ambucor has a great group of workers. They are always so helpful when I call, so friendly and easy to work with. You have all been great and I need you to know that I appreciate everyone." have been confirmed in numerous clinical trials.